In late August Russia handed over decoded radar data to the Netherlands from the aerial zone where Malaysian Airlines Flight MH17 was shot down on July 17, 2014. These materials had initially been provided in their original, i.e., non-decoded form, along with the software needed to decode them. However, the Dutch investigators, despite being armed with the latest in modern technology as well as the assistance of their British colleagues, were not able to decode the recordings, and in the end they asked Russian experts to do it. In three years this has been the only time they have asked to collaborate. Never before had the commission accepted any Russian offers of assistance. The decoded recordings clearly showed that the missile had been fired from the zone controlled by the Ukrainian military. And this is not some fabricated story concocted by journalists, but documented, technical information. Estimated distance to Flight MH-17 from the Ukrainian-controlled BUK launcher in Zaroshchenskoe at the moment of attack (less than 30km) lies within the operational range, unlike one, presumably operated by the Donbass militia. However, every sign seems to indicate that the decoded information obtained from Russia will not be included in the case file, but will instead face the fate of so much other data that does not fit neatly into the preferred version of the investigation. It will probably just fall into a black hole, which is what happened to the photos of the tragedy that were taken by American spy satellites. In the meantime however, it will not be easy for the investigators to stick to their prescribed approach to the investigation. Independent experts are conscientiously suggesting new avenues of inquiry that could help move the process along. For example, since all of the Ukrainian army’s existing launch sites for its Buk-M1 missile-defense system can be accounted for and examined by the commission, it would be a simple enough matter to establish whether at least one of them was used to fire the missile. An inspection of the 60 existing launch sites within this system is both physically possible and could provide some surprising information. The launch of a Buk-M1 missile leaves indelible “burns” on the ramp that cannot be concealed, even under a new coat of paint. Although that would seem to be a very simple suggestion, it’s a significant one. Kees van der Pijl, a Dutch professor in the Department of International Relations at the University of Sussex and the president of the NGO The Committee of Vigilance Against Resurgent Fascism, recently finished writing a book titled “The Launch: Flight MH17, Ukraine and New Cold War” (Der Abschuss: Flug MH17, die Ukraine und der neue Kalte Krieg). The German-language version of the book will go on sale later this month, and the English original and Portuguese translation will be available by the end of the year. Professor van der Pijl examines the tragedy from a geopolitical perspective and asks: who benefited most from this disaster? And he answers: the US, which subsequently imposed sanctions against Russia, undermining its gas industry and checking its growing role on the international stage. One day before the tragedy, the BRICS nations signed an agreement to establish their own bank, which the US saw as a rival to the IMF and World Bank. Vladimir Putin and Angela Merkel had settled on a new conceptual framework for resolving the crisis in Ukraine – without US input – and real progress was being made. In addition, once the Boeing 777 was downed, American gas companies were suddenly able to find the traction to kick-start their work in Europe and force Russia out of the EU market. Moscow was forced to abandon the construction of the South Stream gas pipeline, and relations with the government in Kiev, which subsequently became a pawn in the games played by the West, definitively soured. Not a single European or American media outlet has reacted to the announcement of the book’s publication and its path onto the shelves of bookstores is unlikely to be an easy one. However, times are changing, and many people are taking an interest in and flocking to Professor van der Pijl’s blog, Der Abschuss Flug MH17, which provides information about the publication of the book as well as links to his sources. 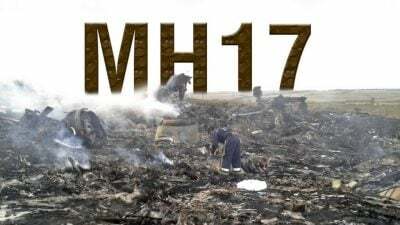 How could Ukrainian President Poroshenko, who announced the tragedy 15 minutes after it occurred, have known that the Boeing 777 had been shot down by a Russian Buk missile? Why does the investigative commission not take into account the results of the experimental destruction of a retired passenger airliner by the company Almaz Antey, while also refusing to take part in a second experiment? What prompted Ukrainian dispatchers to alter MH17’s flight path right before tragedy struck? The publication is based on Dmitry Sedov’s article by Strategic Culture Foundation (in Russian), adapted and translated by Oriental Review.